The LEGO Movie 2: The Second Part will feature Jason Momoa’s Aquaman when the movie hits theaters. The social media account for the sequel teased Momoa’s involvement in a humorous video. The actor is currently riding high on the success of the standalone Arthur Curry movie, which is enjoying its second weekend at the top of the box office. In just a short amount of time, Aquaman has surpassed Justice League‘s worldwide box office total and it shows no sign of stopping anytime soon. 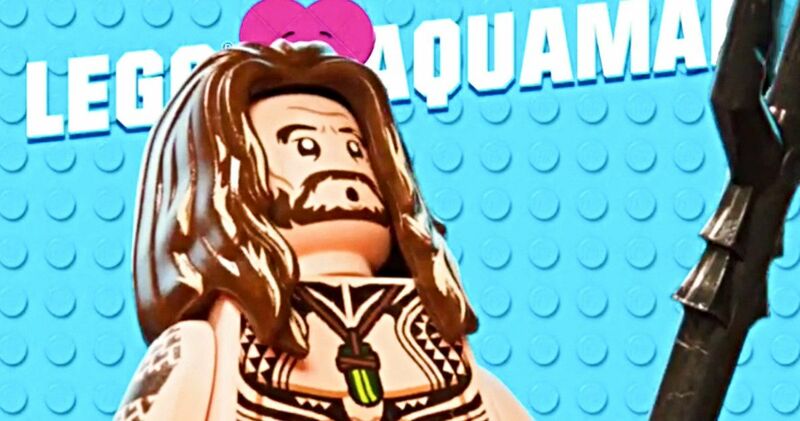 The Instagram account for The LEGO Movie 2 released a video of Jason Momoa’s Aquaman in block form and he looks just as ripped and buff as he does in real-life. The character is shown surfing and pulling off a pretty intense aerial maneuver, but he isn’t using a traditional surfboard. Instead, he takes the old school comic book-style Arthur Curry, shoves his face in the water and uses his body like a surfboard. The clip is really short, but it’s also pretty funny at the same time. Jason Momoa and Aquaman director James Wan wanted to make Arthur Curry more of a cooler character for the movie. The original comic book version of the character and the one from the Super Friends cartoon weren’t exactly known as the most awesome takes on the character and Momoa and Wan attempted to remedy that while making the new movie. It looks like they achieved their goal and watching Momoa’s Curry ride the original character like a surfboard only goes on to prove that fact, even though he probably would have made for a better boogie board instead. Jason Momoa isn’t the only actor from the DCEU to show up in The LEGO Movie 2. Margot Robbie is back as the voice of Harley Quinn in the sequel, while other DC characters are voiced by different actors. Will Arnett reprises his role as Batman and Bruce Wayne from the first installment, while Channing Tatum takes on the voice of Superman in the highly anticipated sequel. Additionally, Jonah Hill is voicing Green Lantern, which is pretty cool. Infinity War star Chris Pratt and Elizabeth Banks lead the huge voice cast. The LEGO Movie 2 hits theaters on February 8th, 2019. The sequel was initially planned before the first installment was such a huge success, as the studio felt that they had something special on their hands. The first movie was almost universally praised and earned over $469.1 million globally, netting a $229 million in total profits. The success guaranteed that a sequel was going to happen, but it hit a few snags behind-the-scenes before it could get past the development phase. However, everything seems to be on track for the upcoming release date, which will feature Jason Momoa’s Aquaman. You can watch the Arthur Curry tease below, thanks to The LEGO Movie Instagram account.